Do you really know the people living next door? Would you like to? Then Nextdoor is the app for you! While Facebook is for ‘friends’, Twitter for trending ‘news’, and LinkedIn for ‘business’, Nextdoor is for connecting neighbours and those in your locality…in virtual reality! There are so many things we may need to communicate with our neighbours about, we just needed an easier way to connect with them. There are currently 180,000 neighbourhoods across the world using the app at present, (14,000 in the UK! ), and Nextdoor uses your location to refine your network to those in your immediate area, instead of connecting you to any user across the world. Users can communicate with their neighbours about their community and recommend local services and businesses that they like. Business owners and organisations can also use the appt to target their local customers and offer specific services to them! Through this, the power of word-of-mouth via the app can encourage increased sales and profit in the community. 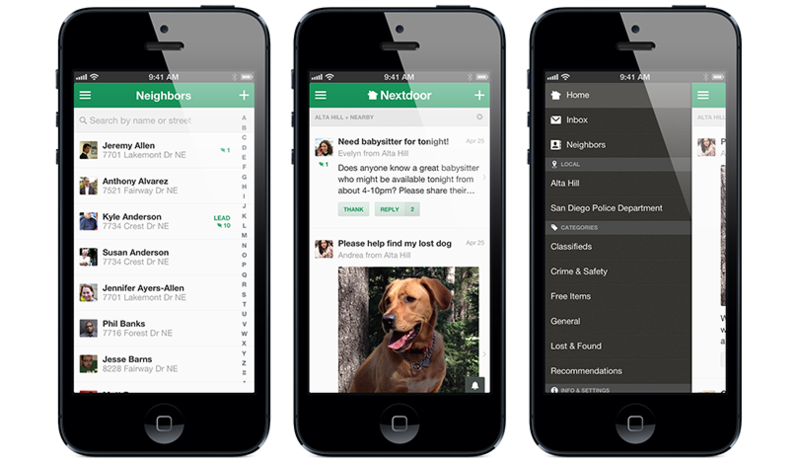 Nextdoor members must undergo a variety of safety checks before being an approved member. Or, they must be invited to join by a current approved neighbour. The app verifies each person’s address and real name and addresses or personal information is never shared with third parties! Users can use the app for just about anything really, from sharing information about a new shop owner to reuniting lost pets with their owners! Buying and selling – Nextdoor offers an easy way to buy and sell locally. Forget delivery charges, head to the ‘For Sale or Free’ page and arrange with your neighbours. Listings also appear on the feed, so you can keep up to date with items as they are listed. Not only this, but there is a feature that you can use to look at new properties on the market in your area. Put on an event – Users can easily use the app to organise events within their local community. The app can be used to message or set up events that the whole neighbourhood can be involved with. Get recommendations – Users of the app can look up and write reviews of local business’, like a new café that’s just opened up, and share your experience with the community.